FTSE Indexes were mixed on Wednesday trading mostly flat as investors awaited insight on the U.S. economy from the Federal Reserve’s April meeting minutes. The FTSE 100 Index was lower at 6,165.80 for a loss of -1.97 points or -0.03 percent. The FTSE 250 was higher gaining 36.16 points or 0.21 percent to close at 16,881.24. The Federal Reserve is scheduled to release its April meeting minutes after the close of markets in Europe and the analysis will likely affect market trading globally on Thursday. Economic indicators in the U.S. have reportedly been weakening and the most recent GDP report which showed growth of 0.5 percent for the first quarter combined with a much lower than expected reading from April’s Employment Situation Report have investors trading cautiously. 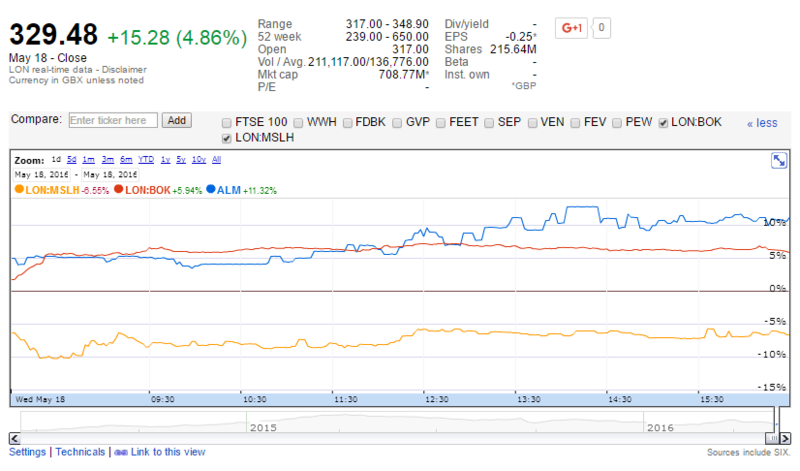 For the day, actively traded stocks in the FTSE indexes included, Allied Minds, Booker Group and Marshalls. Allied Minds led stock gains with an increase of +15.28 or 4.86 percent to 329.48 GBX after new certifications were received for its subsidiary Federated Wireless Inc. in the telecom sector. Booker Group was also higher for the day after analysts improved their outlook on the company. Booker Group gained 9.10 points or 5.52 percent to 174.00 GBX. Marshalls reported losses for the day after a weaker outlook for revenue was reported by the landscape products company. Marshalls was down -22.90 points or -6.60 percent to 324.00 GBX. Source: Allied Minds, Booker Group and Marshalls. Google Finance. Data from IFA magazine reported the following stocks leading gains and losses in the U.K. on Wednesday. In other European markets, France’s CAC 40 was up 21.73 points or 0.51 percent to 4,319.30. The Stoxx Europe 600 was up 2.86 points or 0.85 percent to 337.58. Germany’s DAX was up 53.04 points or 0.54 percent to 9,943.23. The Europe Dow was up 4.13 points or 0.27 percent to 1,536.44. In Asia, stocks traded mostly lower. The Nikkei 225 in Japan was down -8.11 points or -0.05 percent to 16,644.69. Hong Kong’s Hang Seng Index was down -292.39 points or -1.45 percent to 19,826.41. In India, the S&P BSE Sensex was down -69.00 points or -0.27 percent to 25,704.61 and the NSE Nifty was down -20.60 points or -0.26 percent to 7,870.15. In China, the Shanghai Composite was lower at 2,807.51 for a loss of -36.17 points or -1.27 percent. As a broad market measure, the Asia Dow was lower at 2,593.91 for a loss of -16.61 points or -0.64 percent. In the U.S., stocks traded mostly higher on Wednesday. At mid-afternoon in the U.S., the Dow Jones Industrial Average was up 17,628.70 for a gain of 98.72 points or 0.56 percent. The S&P 500 Index was higher at 2,059.39 for a gain of 12.18 points or 0.59 percent. The Nasdaq Composite was higher by 43.29 points or 0.92 percent at 4,759.03 and the Nasdaq 100 was higher at 4,351.57 for a gain of 29.02 points or 0.67 percent.